Pioneer AVIC-Z910DAB multimedia met navigatie - Car Hifi | Car Audio winkel: Autoradio, Subwoofer, Versterker, Speakers, Bluetooth, Inbouw Car Audio. 1. Dietz 1,5 MM spea..
2. 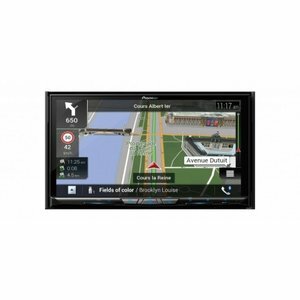 Dietz 2,5 MM spea..
Pioneer's flagship AVIC-Z910DAB not only includes detailed built-in European HERE navigation maps, it now takes smartphone connectivity to a whole new level, thanks to built-in Wi-Fi. Forget messy cables hanging across your dashboard, enjoy Apple CarPlay wirelessly, the Pioneer way. Add to that, Android users can enjoy Android Auto and Waze, (via Android Auto or AppRadio Mode +). DAB+ Digital Radio, Spotify and wireless Bluetooth can also be enjoyed from modern smartphones. This AVIC unit brings a large motorised 7-inch 24 bit True Colour Capacitive WVGA multi-touchscreen into your dashboard featuring new, improved, easy to usegraphic user interface, designed around safe and smooth operation whilst driving. Personalise the settings to your taste, day or night. Pioneer's AVIC-F910DAB also features a HDMI input, to mirror your smartphone, AppRadio Mode +, as well as SD Card input and Dual USB inputs. Lastly, to really get the best from the audio and visual performance, the AVIC-F910DAB features gold plated RCA connectors for the highest audio quality possible. Wi-FiWith built-in Wi-Fi, you can use Apple CarPlay via wireless connection without connection cable, for greater freedom from clutter and complication. HEREThanks to HERE, your Pioneer navigation receiver is ready for the road. Each map update includes new and modified roads, points of interest, addresses, signage, and much more. Android AutoVia the simple and intuitive interface or voice commands you can browse and stream music or engage Google Maps for navigation and live traffic information without taking your eyes off the road. Digital Radio Tick Mark Approved productIn order to be granted use of the tick mark, manufacturers must meet the minimum specification, verified by independent testing. All Pioneer products that use this Tick Mark have been independently tested and approved so you can buy with confidence. 7" Capacitive Touchscreen7" Capacitive Touchscreen allows for very responsive multi-touch gestures like pinch to zoom, plus swipe and scroll controls at your fingertips. Dual USBDual USB opens up a whole new span of options for your system. Plug in your passenger's iPod® while leaving your own connected, practically doubling your music. Keep your iPod® in your car and add new songs into the mix with a USB drive. The possibilities are endless. SpotifyWith spotify, just connect your smartphone via USB or Bluetooth to comfortably browse your favourite playlists, albums, tracks and artists using your headunit contols. Made for iPod / iPhoneWith iPod and iPhone Direct Control, you can manage your i-device directly from your car dashboard and enjoy superior sound. JBL Stage 1010 + kist!